We are very pleased to post below Chris Rudkin’s account of a recent visit to the Madras Literary Society. Chris is a Fellow of the RAS. In January this year (2016) I visited Chennai in Tamil Nadu, India in order to follow up articles from the Indian Press which had recently celebrated the Madras Literary Society’s 200th anniversary of its founding in 1812. My interest was generated from reports that there were over 83,000 books contained in the library building, many of which dated back over 150 years and a few considerably longer. 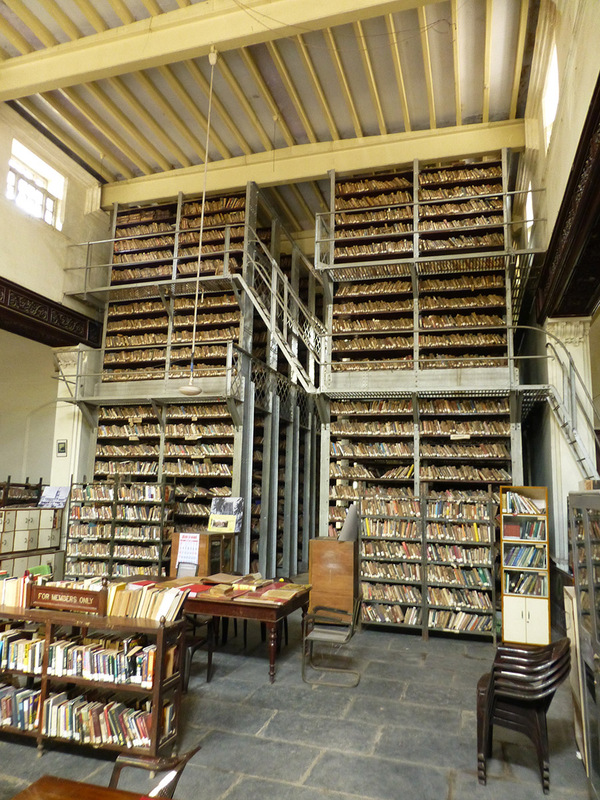 Consequently I contacted the Society’s Honourable General Secretary, Mr Mohan Raman, expressing my interest in the large library and my wish to visit whilst I was in Chennai. The building itself lies within the campus of the Department of Public Instruction in College Road and is a single storey red-brick Indo-Saracenic structure with Rajasthani influences. It was built around 1905 by an unknown British architect of the Raj era. The library itself began its life in 1812 set up under the auspices of the East India Company as an auxiliary of the Royal Asiatic Society, following the Company’s practice of encouraging their employees to form societies. The Bengal Asiatic Society and the Bombay Asiatic Society are examples which preceded the formation of the Asiatic Society of Madras. 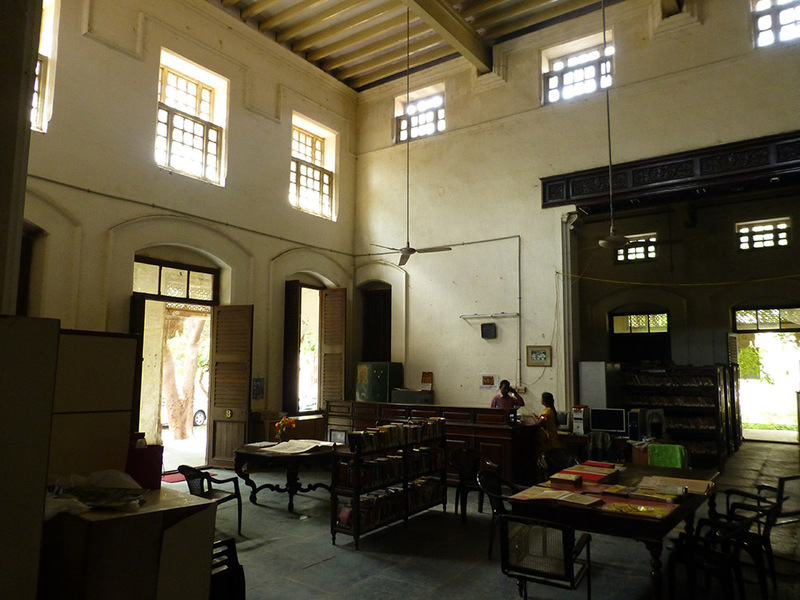 The Society was first housed in the College of Fort St George, but subsequently moved to the still-existing Connemara Library and then in 1905 transferred as the Madras Literary Society to its current home, along with the 83,000 books. Members from the past include Annie Besant, Subhas Bose, and Dr S Radhakrishnan. There are stories of British officers rowing down the River Cooum, gliding to a halt outside the rear entrance and clambering from their sculls to enter the building in order to relax in the leather bound chairs to read books or the latest copies of Punch and other satirical journals of the day (some still existing in the library). Entering the building today, one is immediately drawn into an atmospheric, ancient domain of fading scholastic decorum, something akin to a scene from a Harry Potter setting. The thousands of books are contained in metal racking from floor to ceiling and as far into the building as the gloom allows. The Society’s Honourable Secretary, Mohan Raman, is a retired Indian Naval Rear Admiral who once designed aircraft carriers and can describe in some detail every British Naval Dockyard which he has visited during his service. His anecdotes and stories are legion and his enthusiasm for being the guardian of a very large collection of books is catching as he recounted the huge reach and depth of the subject matter contained in them. The books themselves are generally in a fairly sorry state. Their age and the all-consuming tropical climate has taken its toll, especially those printed during the 19th century when the paper was very acidic and many of which have turned black and fallen apart. The subject matter ranges from mathematics, geology, geometry, biology, chemistry, physics, geography etc. which could be described as old text books, to those covering art, religion, languages, law and local customs. There are some novels, encyclopaedias, histories, memoirs, biographies as well. There about 200 books earmarked for restoration, each of which costs about £30 to restore. Some of the rare books include Aristotle’s ‘Arretolis Opera Omania QVAE Extant Graece and Latine’ (published 1619), Isaac Newton’s ‘Philosophie Naturalis Principia Mathematica’ and Robert Boyle’s works Volume III (1772). The Society does still act as a lending library, but the books lent out are printed after 1950 and the number of users is dwindling. It survives on a small grant, contributions from benefactors and membership fees. The books are being slowly catalogued using the Dewey Decimal system and kept on their computer. 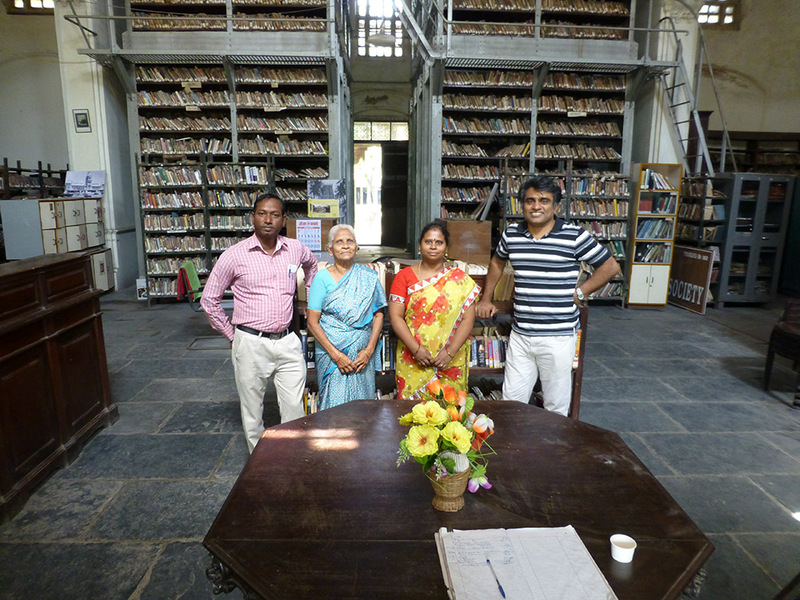 This work is being undertaken by the only full-time employee, Uma Maheshwari, who is the librarian. Looking to the future, Mohan Raman says the institution is walking a fine line between being a library stuck in the past or one which takes its readers changing preferences into account. He reckons the character of the library cannot be changed in four or five years, that it would take 40 to 50 years to become either a popular lending library, shedding itself of the old and rare books, or to become a reference library requiring specialisation and the acquisition of new books. One of the beneficial side effects of the Madras Literary Society is the opportunity for people to get together for conversation, discussion and debate on a wide spectrum of issues. Indeed, whilst I was there a visiting professor from California with his son, an Indian archaeologist, a former colleague of Mr Raman’s, and a few other visitors arrived simultaneously and we entered into a very interesting discussion about the origins of the Indus Valley Civilisation. This discussion, Mr Raman assured me, represented another aspect of the unique quality of the Society – to embrace ideas with others in an entirely ad hoc way, overlooked by 83,000 silent witnesses some of whose pages may themselves have been able to illuminate the conversation! Before leaving and having passed on the best wishes of the Royal Asiatic Society to Mohan Raman and the Madras Literary Society, he responded by inviting any passing Fellow to drop by, should they be in the Chennai area, for tea and conversation!